Andrew Issacs, 33, of Westbury Lane, Coombe Dingle and Kemar Lewis, 29, of Havilland House, St Judes ran a waste company trading under the names of Andrew & Sons and Bristol Rubbish Clearance. In November last year, Andrew & Sons were hired to remove old garden sheds and household waste from a property in St Andrews, Bristol. The rubbish was later found fly-tipped in a lane in Tormarton on 3 December 2012. During another incident, the firm were booked by to carry out a house clearance from a property in Brislington. The householder believed they were a reputable company which was licensed to carry waste and paid them £180 to remove a full lorry load of rubbish including suitcases, glass, pictures, cans of paint and clothing on 5 January this year. 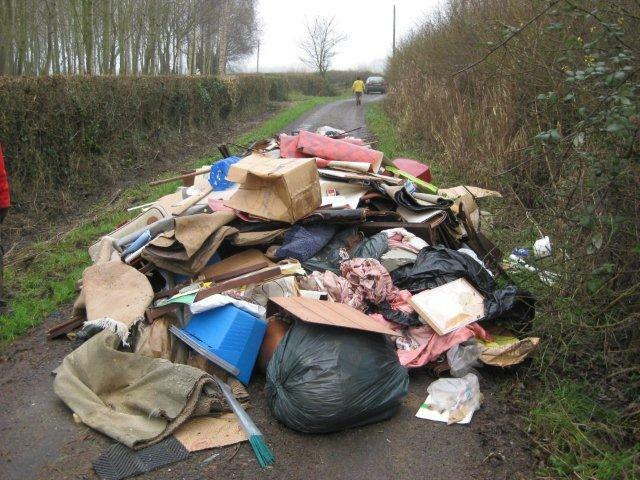 The rubbish was found tipped in the middle of Gumhurn Lane, Pilning, the next day. There was so much rubbish it completely blocked the lane and had to be removed by the council’s emergency out of hours team. Despite illegally fly-tipping the first load of waste, the partners returned to the Brislington house a few days later to remove the rest of the rubbish, charging a further £100 for disposal. No waste transfer notes could be provided to show the second load was legally disposed of. In summing up, the magistrate stated they were jointly responsible, both corporately and individually of tipping the waste. Their actions deceived the public who thought they were employing a legitimate waste firm, and they caused significant inconvenience by blocking access to a farmer’s field and the road to a residential property. Both men were sentenced to six months in prison and ordered to pay £2,487 each in costs. Isaacs’ and Lewis also admitted to 11 further offences of failing to provide waste transfer notes which was taken into account. The waste transfer notes show that waste is being disposed of properly and must be kept for two years. Both men pleaded guilty to the charges when the case was heard at North Avon Magistrates’ Court in Yate earlier this month on 11 November. The case was adjourned for pre-sentence reports and sentencing was carried out on Tuesday 26 November. They were arrested in April this year following a joint operation with Avon & Somerset Police and officers from South Gloucestershire Council’s envirocrime team. Residents are encouraged to reuse or recycle any unwanted goods or you take them to your nearest SORT IT! * centre.